Back on August 10th, NVIDIA announced that it had updated its industry-leading nForce4 SLI chipset with the introduction of the nForce4 SLI x16. The biggest news to come from that announcement was the fact that Dell snapped up the Intel version of the nForce4 SLI x16 chipset for its top of the line XPS system. Unlike all other nForce4 chipset solutions, nForce4 SLI x16 uses a North and South Bridge combination. The North Bridge is similar to the one used in the nForce 410/430 boards, codenamed C51. The nForce 410/430 boards use the C51G North Bridge, which includes integrated graphics in the form of GeForce 6100 or GeForce 6150. In contrast, the AMD version of nForce4 SLI x16 uses the C51D chip for the North Bridge, which goes by the name of nForce SPP 100. As far as we're aware, it's basically the same as the C51G North Bridge, minus the integrated graphics portion of it. It features 18 PCI-Express lanes with 16 of those used for the primary PCI-Express x16 slot. The South Bridge is the familiar nForce4 SLI MCP found on all previous AMD-based SLI motherboards and it accounts for the second PCI-Express x16 slot. The nForce SPP 100 and nForce4 SLI chips are joined together with a 16-bit 1GHz HyperTransport bus that delivers 8GB/s of bandwidth - exactly the same bandwidth as is between the chipset and CPU. The increase in PCI-Express lanes means that there is room to use two video cards in SLI mode with both PCI-Express slots running in x16 mode. There is also the inclusion of RAID 5 support - something that wasn't in the original version nForce4 SLI chipset. ASUS are first to market with their A8N32-SLI Deluxe nForce4 SLI x16-based motherboard and we're putting it through its paces today. Will it topple the A8N-SLI Deluxe or DFI nF4 SLI-DR? We find out over the next few pages. 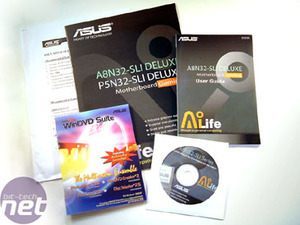 User guide, motherboard support CD and Intervideo WinDVD Suite. With the exception of a couple of things, ASUS has included a very comprehensive bundle of extras with the A8N32-SLI Deluxe. 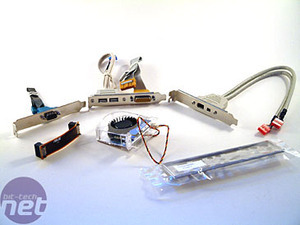 There is a complete complement of SATA cables for the internal ports, including power cables just in case your power supply unit doesn't have SATA connectors already. There are also enough ribbon cables for the two IDE ports and floppy port. They're not rounded cables, but they do appear to be good quality cables - some of the bundled rounded cables we've seen can look rather cheap and tacky. There aren't a full complement of USB2.0 ports on the expansion bracket, but its possible to use six out of the ten that the nForce4 SLI x16 chipset supports. The USB2.0 expansion bracket also comes with a game port for those of you still using legacy joysticks or game pads. There are also expansion brackets for IEEE 1394a Firewire and serial. Rather than the typical PCB-based SLI bridge, ASUS has decided to include a ribbon-based 'soft' SLI bridge. It might prove to be a better solution when water-cooling if your cards are ever so slightly bent because of the video card waterblocks, but we can't see it making much of a difference in all honesty. 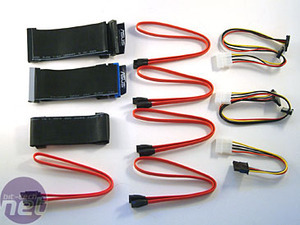 There are no E-SATA cables included, but we suspect that external Serial ATA devices will come with the required cables and connectors. 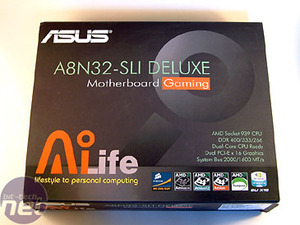 On the whole, the bundle is very good - it's pretty typical of ASUS to supply the board with everything you need to use all of its features.